EDGI Member, Op-Ed Re-blogged from Cultural Anthropology Dispatches January 17, 2017. Many of Donald Trump’s disinformation tactics go in two related directions: grandiose promises to rally his base, and trolling or decoy statements meant to incite but confuse his enemies. The promise to build a wall with Mexico and make Mexico pay for it does both at once. 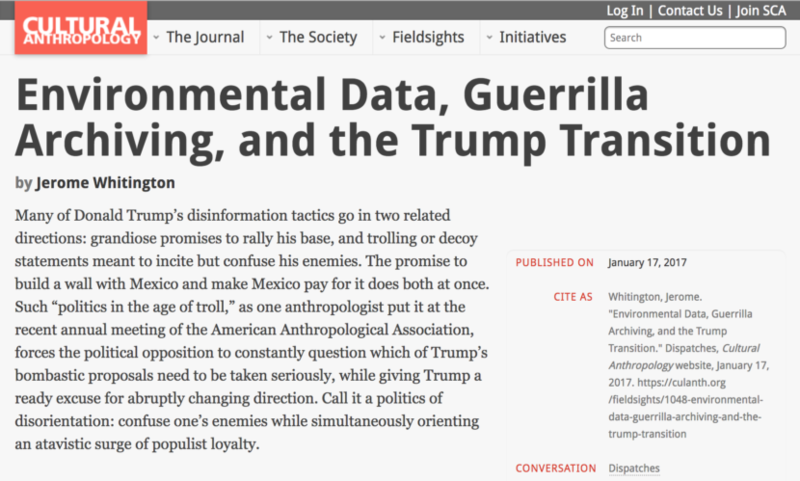 Such “politics in the age of troll,” as one anthropologist put it at the recent annual meeting of the American Anthropological Association, forces the political opposition to constantly question which of Trump’s bombastic proposals need to be taken seriously, while giving Trump a ready excuse for abruptly changing direction. Call it a politics of disorientation: confuse one’s enemies while simultaneously orienting an atavistic surge of populist loyalty. Unfortunately, when it comes to the environment, Trump’s approach is crystal-clear. The list of his appointments speaks unambiguously to radical deregulation: climate denier and attack dog Marion Ebell; Scott Pruitt, who brought us Oklahoma fracking earthquakes; Koch Industries lobbyist Thomas Pyle; and ExxonMobil CEO Rex Tillerson. That’s the short list. What’s more, all indications show that the Trump administration will work rapidly to adopt a wide-ranging body of think-tank conservatism in the form of specific proposals for rolling back federal environmental policy. All signs point toward a wholesale attack on environmental governance. When we ignore what Trump says and watch what he does, there is no confusion. Through a project we call #DataRescue, the Environmental Data and Governance Initiative (EDGI) has formed as an organized response to this rollback. Because access to and control over data is a key piece of effective regulation, we have taken action to systematically archive valuable environmental datasets, create usable nongovernmental data access, and preserve records of wide-ranging, ephemeral, web-based policy and program information. This monitoring and tracking work has also created an opportunity for providing rapid analysis of environmental regulation during the transition. Formed as a decentralized team of about forty social scientists and researchers immediately after the election, EDGI has focused on these two primary goals: documenting and analyzing the transition, and rescuing federally maintained data. We started with a prominent guerrilla archiving event at the University of Toronto, organized by founding members Michelle Murphy, Patrick Kielty, and Matt Price, which attracted prominent media attention from the Washington Post, BBC, and other media. With extensive involvement from librarians and computer programmers, the initiative brings together expertise on environmental politics—especially environmental justice—with archival, data management, and software development skills. Our approach is to rely on existing tools as much as possible, while creating open-source tools and protocols as needed. With more than one hundred participants, the Toronto event nominated over three thousand pages on the Environmental Protection Agency (EPA) website to the End of Term Archive, developed a browser extension to streamline the data harvesting process, and worked on other software and protocols to better orchestrate future efforts. One outcome is that the EPA is now the best represented agency in the End of Term Archive; we also now have a website, funding support, and a toolkit that will make it much easier to organize subsequent events. Public archiving events take advantage of our lead members’ wide geographical spread. One powerful subsequent event was hosted by the Penn Program in Environmental Humanities, which created the #DataRescue tag. The team at the University of Pennsylvania, collaborating with EDGI members, is developing further tools for handling data that does not fit into the End of Term Archive and for linking efforts between events to avoid gaps and duplication. Further events are planned for Indianapolis, Los Angeles, and New York City, targeting data hosted by bodies like the Department of Energy and NASA. Through a commitment to open-source and free software principles, these events maintain a decentralized character in which different groups can focus on policy areas and infrastructure priorities that fit their interests and skills. The fact that data is the object of this initiative—and not, say, regulation—should give anthropologists pause. One might argue that the #DataRescue project is a defensive effort meant to prop up the status quo, namely, the prominent role of data in neoliberal environmental governance. As Michelle Murphy (2013) has shown, neoliberal environmental governance works through monitoring and publicly accessible data that communities can use to organize themselves. (Consider the lead contamination in Flint, Michigan as an especially public instance of this.) In this context, we are in the difficult position of trying to shore up this data-centric approach, fully aware that environmental data and public participation are too easily fetishized. At the same time, we demand a positive vision of transparent environmental governance in which federal regulations ensure access to safe environments. Furthermore, systematic data collection holds a distinctive place in science-based regulation, as we know from debates about climate change. Here, we see what Murphy calls the politics of imperceptibility. Much toxic pollution is insensible without particular instrumentation or, in the case of climate change, planetary-scale data efforts. Anyone with experience trying to enforce regulations in, say, the Appalachian coal fields will be familiar with a long history of legal failures in the face of insufficient evidence. This politics of evidence dovetails with histories of racial and class-based marginalization. Institutionally, it is easy enough to undermine data by defunding IT systems and data maintenance, or simply by reassigning key staff working on controversial topics. One insidious tactic is to demand rigorous science while cutting funding, and then claim that existing data does not pass muster. As toxic exposure and climate risk are made literally invisible by systemic erasure, environmental justice means something as straightforward as the ability to enforce existing laws. Securing data access against the onslaught of deregulation is clearly only part of what is necessary. Yet, by doing this work, we are in the position to analyze Trump’s approach to the environment in concrete terms, hopefully with a relatively rapid analysis of the transition. We plan to produce a white paper on the first one hundred days of the administration. At the same time, we have been forced to contend in detail with the organization of federal environmental policy, what data should be prioritized, and what our responsibilities are for developing archiving and access tools. It is worth pointing out that this reflexive work is integral to all work with data, and helps demonstrate how data are integrated into the warp and weft of contemporary social organization. Another way of saying this, to echo Kim Fortun, is that informating environmentalism needs to be at the heart of how anthropologists take up late industrialism’s toxic consequences. Through the final stretch of the election, the Democratic platform rested partly on the claim that Trump was not fit for office. But his environmental policy shows that this concern may be a distraction: like his support for organized white supremacy, it is not Trump’s flamboyant person but the forces he has empowered that will constitute his lasting legacy. Murphy, Michelle. 2008. “Chemical Regimes of Living.” Environmental History 13, no. 4: 695–703.